If Super Hexagon was the equivalent of a dance competition, Pivvot is a night out at the clubs. In fact, the entire affair reminds one of a hazy night out on the dance floor—the changing colors, the pulsating lines, the hypnotic dance grooves. Pivvot doesn’t want you to slam your phone down when you don’t break your high score 15 times in a row—it wants you to just keep grooving to the beat. 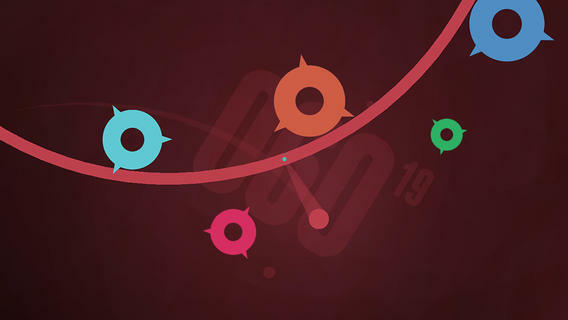 In Pivvot you don’t control the dot that’s moving around in the abstract space of lines and color. You actually control the swiveling circle attached to the dot that’s moving around. As the dot follows the line, your job is to keep the little circle that pivots (wink wink) from colliding with any obstacles that may come its way. The controls work in similarly to Super Hexagon—tap left on the screen to pivot left around the dot, tap right to pivot right. It seems straightforward, but things can get pretty tricky once you are upside down or sideways and left becomes right and right becomes left. Thankfully, the controls in Pivvot are not nearly as fast or responsive as they are in Super Hexagon, resulting in a much less frantic experience (although you can change the sensitivity in options). The animations aren’t as obtuse and unpredictable, the geometric shapes less angular and unrefined, and the whole thing shines with a professional level of polish. And while all that adds up to a somewhat less memorable experience, it’s the small things that Pivvot gets right that make it so hard to put down: the way the music slows down once you inevitably lose but never actually stops, or the way the “restart” button so quickly gets you back into the game. Even so, Pivvot will certainly provide you with your fair share of blood pumping stress, like when you barely make it past a series of obstacles only to not have enough time to catch your breath before the next series arrives. Fortunately, the game features an innovative mode called Voyage that lets you learn how to get around each obstacle one by one. Voyage mode lets you switch between a tutorial stage where you have to repeatedly pass each obstacle and the normal stage where you’re up against randomized assortment of obstacles. The game’s softer learning curve transforms what would have been a devilish arcade game into something that might be accessible to almost everyone. The music playing in the background is unashamed Daft Punk worship, but it’s an undeniable match for the glowing Tron-esque white lines running through the visuals. It’s this attention to detail in design that keeps the game feeling fresh no matter how many hours you log in it. With two more advanced modes as well, Pivvot will keep you enthralled with its flashing lights and simple dodging mechanic for a good long while. And though Pivvot isn’t the Super Hexagon sequel that everyone wants it to be—it doesn’t have the same unwavering desire to piss you off—just keeping you grooving to the beat is a worthy accomplishment on its own.